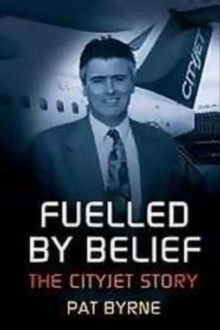 Written by the company's founder and first CEO, Pat Byrne, "Fuelled by Belief" tells the remarkable story of how a fledgling airline, against all odds, literally stayed in the air. Set up in 1993 to fly business travellers to London City Airport and back from Dublin, Cityjet was highly regarded and developed a loyal customer base, but was continually struggling to compete in a very difficult market. A promotional deal with Virgin Airlines seemed to be the answer, but the deal eventually went sour and by 1997 Cityjet had accumulated losses of Euro 16.5 million. The company went into examinership, emerged again with new investors, but the financial woes continued. Thanks to committed management and a hard-working staff Cityjet somehow managed to stay in business but time was against them. Eventually, seven years after it was founded, Cityjet became a wholly owned subsidiary of Air France and Pat Byrne's dream of running his own airline was over. Unbowed, however, in "Fuelled by Belief", Pat Byrne looks back with pride as he tells a tale of striving to beat the odds in an extremely competitive and volatile business. "Fuelled by Belief" will be of interest to entrepreneurs, business students, airline buffs and anyone intrigued by tales of business survival.